Hello there and thank you for stopping by today. Today is the first day of the MFT Jungle Friends Card Kit Countdown. Only 1 day until the new release (yay)! Be sure to head over to the MFT Blog for the full kit reveal. It includes everything you need to make a plethora of adorable (interactive) cards. 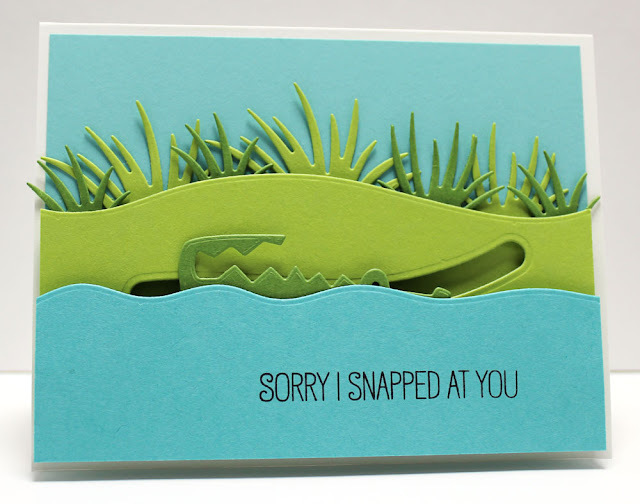 My card today uses the cute alligator. I had this idea in my head even as the product was being developed, so I was so excited to execute the idea and see it come to life. The alligator is anchored in 2 areas to make it easier for him to slide along the track more easily, and without spinning. He jumps out of the water. I am SO in love with this kit! This new card kit will be available for purchase in just one day, on April 19 at 10 PM EST. Be sure to check out the MFT Blog to see what the rest of the team has come up with today. Jody Jungle Friends and Surf n Turf look so much fun. MFT have outdone themselves with the slider Die-namics and spinners to match. 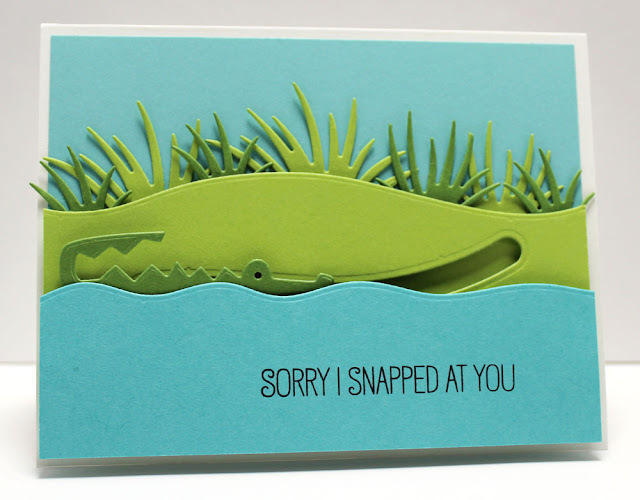 Your card looks like a lot of fun, I'm grateful your crocodile is a Friend! Please thank your tech savvy daughter, Madeline, for me as she has done a wonderful job making your card interactive for us. Love this interactive slider creation! Such fun! What a sweet way to say "I'm sorry" to someone. Adorable card! Love how your gator comes up out of the water. What a cute card & sentiment. This moveable card is so great! 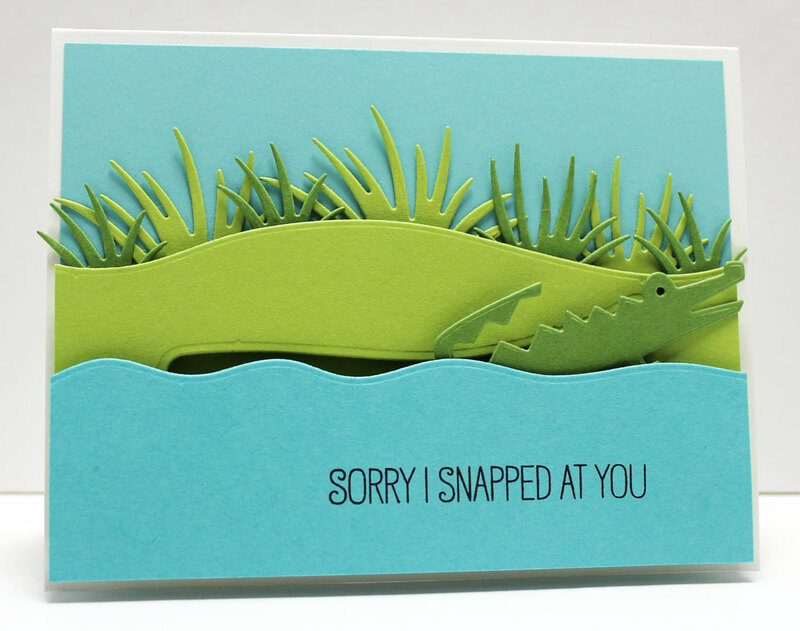 Adorable...love how your gator comes up out of the water!! Great kit, fabulous layout, super dies and a really good job! This is a great idea for a card! I love the little gator and the sentiment too! That is just how alligators come up out of the water. I live in Florida where I've seen them do it. Thanks for a cute card! i like your multi colored grasses. An adorable card. This set is going to be used a lot. Super cute card!!! I can't see the video though cause when I click it, it just takes me to Pinterest. I've tried everything I can think of but nothing works. Very cute! Spinner cards are always a hit with my little nieces and nephews. What an adorable card - I love interactive cards and can't wait to try making this one! Great alligator that can do the slide!